On Saturday, October 10, a hushed crowd of Gabriela Network (GABNet) members, alumni, supporters, and political allied sat in the USD Kroc Institute for Peace and Justice. The strum of a guitar and the lone voice of woman singing opened up the festivities of GABNet's 20th Anniversary. Those gathered shared in the long history of the first progressive Philippine women's organization in the United States. A pictorial profile of the organization's twenty year history featured activities, events, and growth of the organization. Dr. Annalisa Enrile commented, "The foundation of GABNet is it's membership. The women who have come through GABNet and who continue to be a part of the organization are what makes GABNet creative, community based, and relevant." Founder Ninotchka Rosca was honored. In her response, she gave the parable of The Foolish Old Man and One Smart Girl (see full text at www.ninotchkarosca.blogspot.com). Always forward looking, Rosca commented on GABNet's last 20 years as being "just practice for the real work which will define the next 20 years." Rosca's emotional and powerful speech was followed by a formal program highlighting ten major GABNet campaigns. 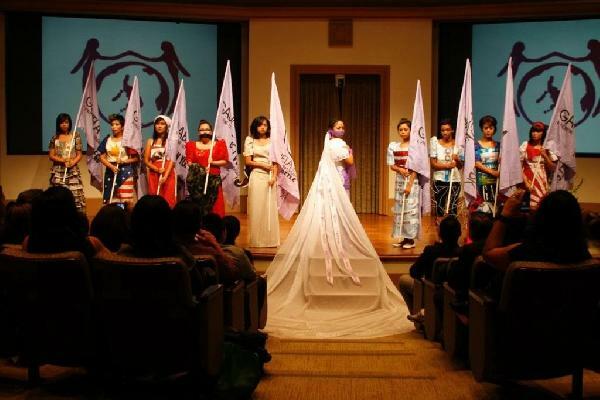 The multi-media presentation included narratives, photos, videos, and a political art show using the canvas of the terno, traditional colonial national dress of Philippine women, to present a political issue. The dresses were a "reclaiming of our womanhood," explained GABNet Creative Director, Loralei Bingamon. The fashions included GABNet's campaigns against Militarism, the Mail-Order Bride Industry, Political Repression, Globalization, and the GABNet 3, Purple Rose, Immigrant Rights, Reproductive Rights, Comfort Women, and Dollar 4 Divorce campaigns. The program closed with an address from the organization's Secretary General, Jollene Levid who declared, "GABNet is an organization's of firsts and we are now looking forward to a higher stage of organizing, political work, and theory-building." A celebratory reception was held at the Rotunda of the Institute. Allies and supporters from organizations like the ANSWER anti-war coalition, the Alliance for Just and Lasting Peace in the Philippines, Pilipino student organizations from all over California, women's centers, reproductive rights advocates, enjoyed the repast and conversed about GabNet's role in their lives. Women from El Salvador, Uganda,Pakistan, and the Philippines also joined in the festivities. GABNet thanked their guests, affirming their commitment to serving the community and continuing their struggle for transnational women.